Obsequi[u]mque doces et amorem quaeris amando. Darunter 2zeil. Widmung des Stechers an die Große Loge von England. 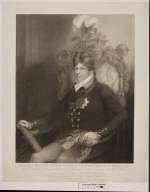 Punktierstich: <u.M.> Drawn and Engraved by Edmund Scott, Portrait Engraver to their Royal Highnesses the Prince of Wales, the Dukes of York and Kent. – <unter der Widmung> Publish’d June 4. 1802, by W.Walker, 31, Old Bond Street, Fores, Piccadilly, W.Austin, Russell Street; & E.Scott, No.7, Craven Buildings, Brighton.